It was somehow fitting that 250 years after Lieutenant (later, of course, Captain) James Cook set sail from Plymouth in HMS Endeavour to explore the Southern Hemisphere for the Admiralty and to track the transit of Venus in Tahiti, and 250 years after George III founded the Royal Academy, the latter was the venue for an exhibition celebrating the cultures of the Pacific Ocean. Oceania did this with sympathy and aplomb. 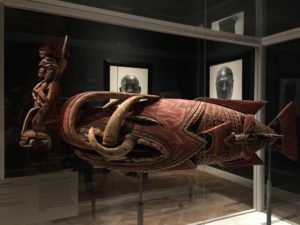 Papua New Guinea and the Kingdom of Tonga partnered with the RA and many of the treasures on display were flown over directly for this exhibition. 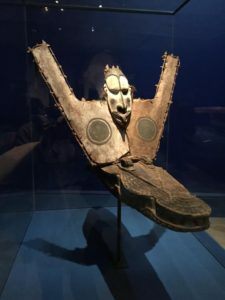 Others came from museums around the world and the exhibition was staged with the collaboration of the Musee du Quai Branly – Jacques Chirac, Paris and the museum of Archaeology and Anthropology, Cambridge. The reality is of course that so many of these treasures were bought, bartered or exchanged by Westerners when they ‘discovered’ these remote islands and ‘primitive’ peoples back in the eighteenth century. Those peoples had, as we now appreciate, been living their own lives with their own cultures for many thousands of years and the arrival of Westerners, whilst fascinating to them in many ways, also brought a threat to that way of life from which they have of course never recovered. This element was shown in some of the more recent objects, but also in the video art work made by Lisa Reihana In Pursuit of Venus (infected) 2015-17 which was on display towards the end of the exhibition. There were some 200 objects on display spanning roughly 500 years up to the present day, and one of the most striking aspects of many of these was how influential they clearly were in the shake-up of Western art which took place in the late 19th and early 20th century. Indeed, the art critic Jonathan Jones, in his Guardian review, went so far as to identify a particular Picasso painting which he felt was entirely derivative. Whether one should blame the modern artists for their ‘ripping off’ of other cultures is questionable. They were obviously fascinated by worlds so far removed from their own, where representational art was just not a ‘thing’. Where representations are to any extent true to life, they tend to be of the birds or fish which were an intrinsic part of the peoples’ island life. They decorate canoes and house gables and appear in various forms as part of tribal headgear. One of the most spectacular is the massive 100 year-old headdress from Papua New Guinea in one of the early galleries – in which incidentally was also a carved and painted (bright red) Steinway grand piano which visitors (if presumably confident enough of their skills) could book one of four slots a day to play. The exhibits were carefully collated in different galleries to illustrate different aspects of the many cultures; the Gods and Ancestors Room or the Spirit of the Gift room, for example. 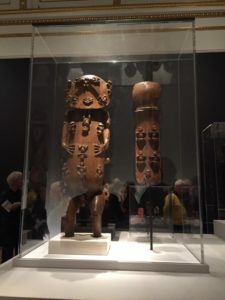 There was a preponderance of exhibits from Papua New Guinea, which as it happened was of particular fascination to the friend with whom I attended the exhibition, as she had in the late 1960s worked for two and a half years in certain parts of the country. For her this stunning exhibition was a reminder of that time gone by, not just for her, but sadly for the many and varied cultures which at that time still existed. Although Westerners had been trickling to these places in small numbers ever since Cook’s ‘discoveries’, the explosion of mass tourism and Westernisation in the last 50 years has made the pace of change accelerate massively. This exhibition was a timely reminder of what we have lost and are losing in the relentless march of modern monoculture. The exhibition closed last week, unfortunately, but if the Royal Academy takes it on tour of the country, as it should, be sure not to miss it again.